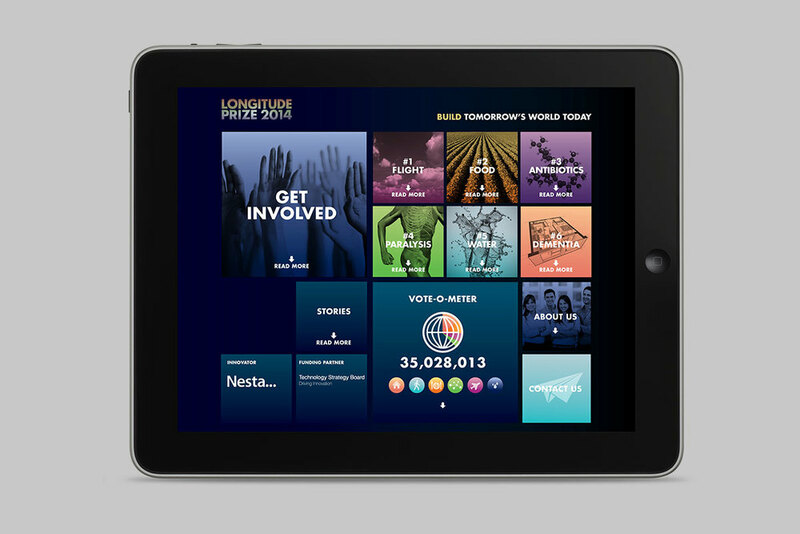 The brief from Nesta was developing a brand identity and high profile collateral for the Longitude Prize, launched in May 2014. To commemorate the 300th Anniversary of the original Longitude Prize (for the invention of a clock that could keep time at sea), a new prize has been launched to encourage inventors and scientists to find solutions to six key problems facing the world. 300 years on, the British public has been asked to vote for one of six scientific challenges and the best scientific minds in the country will attempt to solve them. So the brand, print collateral and copy had to appeal to every man, woman and child in the country, including the more formal audiences of Government, large corporate sponsors and erudite scientific communities. The visual expression used gradients hewn from a Martian sunset – an appropriate visual metaphor since Longitude is about ‘going beyond the stars’. Wherever possible we used innovative materials. When producing communication materials for the Longitude Prize challenges, the individual imagery and iconography was brought to life through vibrant colour gradients and bold typography.